Foster the People at Deer Lake Park, Burnaby, June 25 2012. Jade Dempsey photo. You know what they say – April showers bring May shows. This year is no exception, but things really peak on the weekend of May 23-25. That’s when the annual Sasquatch Music Festival at the Gorge Amphitheatre in Washington State brings hundreds of bands to the Pacific Northwest for our own (potentially rainy) Coachella. So if you’re in Vancouver that weekend, you’ll have options galore – some of the bands playing that weekend include Waxahatchee, (Vancouver’s own) Pink Mountaintops, City and Colour, Brody Dalle, Cut Copy, Chet Faker, Haim (alas, sold-out), Banks, Parquet Floors, Lana Del Ray, and Mogwai. For that weekend’s selection in our six must-see May concerts, we picked – well, see below. Ingrid Michaelson (May 2 at the Commodore Ballroom, 868 Granville St.) – Bespectacled indie-pop singer/songwriter Michaelson is on tour in support of her sixth album Lights Out. Her songs have been featured on too many TV shows, movies and commercials to mention here, but you can see them on her Wikipedia page if you have a spare hour. Tickets: $33.50 at ticketmaster.ca. Show 8 p.m. General admission. Bela Fleck and Abigail Washburn (May 10 at Chan Centre, UBC, 6265 Crescent Road) – Two of America’s finest banjo players present an evening of original and traditional bluegrass compositions. Tickets starting at $36 at ticketmaster.ca. Hugh Laurie with the Copper Bottom Band (May 20 at the Orpheum, 601 Smithe St.) – You know him as House. But Laurie is also an accomplished pianist and blues and jazz lover, and he’s in town to play songs from his latest album, Didn’t It Rain. Tickets $35.00, $45.00, $65.00 at ticketmaster.ca. Show 7:30 p.m. Reserved seating/all ages. 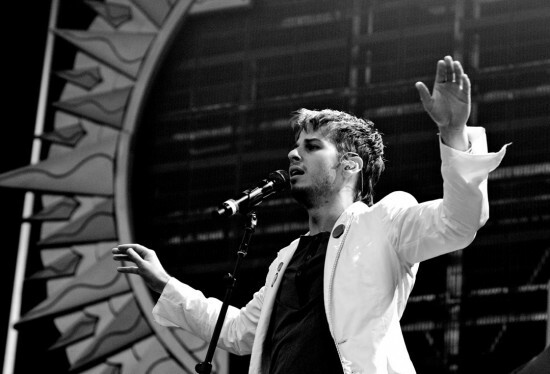 Foster the People (May 21 at the Queen Elizabeth Theatre, 650 Hamilton St.) – Remember “Pumped Up Kicks”? “Helena Beat”? If so you might want to check out L.A.’s Foster the People, on tour for their latest album Supermodel. Tickets $36.50 and $46.50 at ticketmaster.ca. Show: 8 p.m. Reserved seating/all ages. First Aid Kit (May 23 at the Vogue Theatre, 918 Granville St.) – Swedish sister act First Aid Kit on tour for their third album, this year’s Stay Gold. The album is due for release in June; the first single, “My Silver Lining”, was released at the end of March. Tickets $25 at northerntickets.com. Show: 8:30 p.m. All ages. 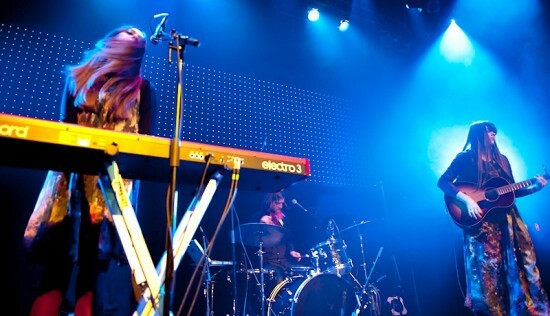 First Aid Kit and Peggy Sue at Venue, Vancouver, April 10 2012. Jordana Meilleur photo. Lady Gaga (May 30 at Rogers Arena, 88 Griffiths Way) – The superstar has a lot to prove with this tour; her most recent album, ARTPOP, didn’t exactly break the bank. Lady Gag’s artRAVE – The ARTPOP Ball begins May 4 in Fort Lauderdale before coming to Vancouver at the end of the month. Tickets: $35.00, $49.50, $85.00, $200 at ticketmaster.ca. Show 7:30 p.m. Reserved Seating, general admission floor/all ages.